Sunday morning blessings comprise of happy children and giggles around the house. My nephew Luca spent the night this weekend. This child is everything you can wish for in a little man. Sweet, funny, witty with plenty of character. My husband had brought back a huge bag stuffed with star shaped goodies. You guessed it: star fruit! Fresh from the tree at the distillery. I knew I had to get my hands on these sweet and sour fruit that is in the shape of a five-point star, before the kids ate them all. So I decided to whisk something special for breakfast. 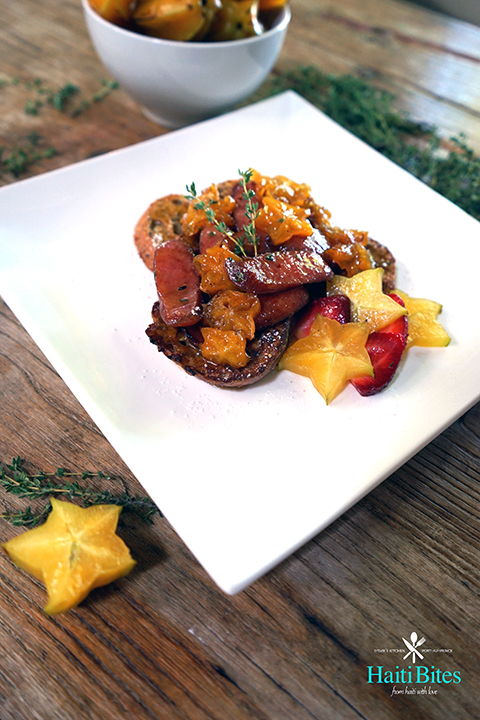 Crispy french toasts with a buttery thyme syrup with star fruit and sausages. Divine! With the long weekend, very long weekend, coming along, some of you may want to whip these in your kitchen. They are so tasty and flavorful that I bet you’ll want a remake the next morning. At least the kids will ask for one. But hurry up and cook them, because if you let the fruits linger around, they’ll be gone in no time. 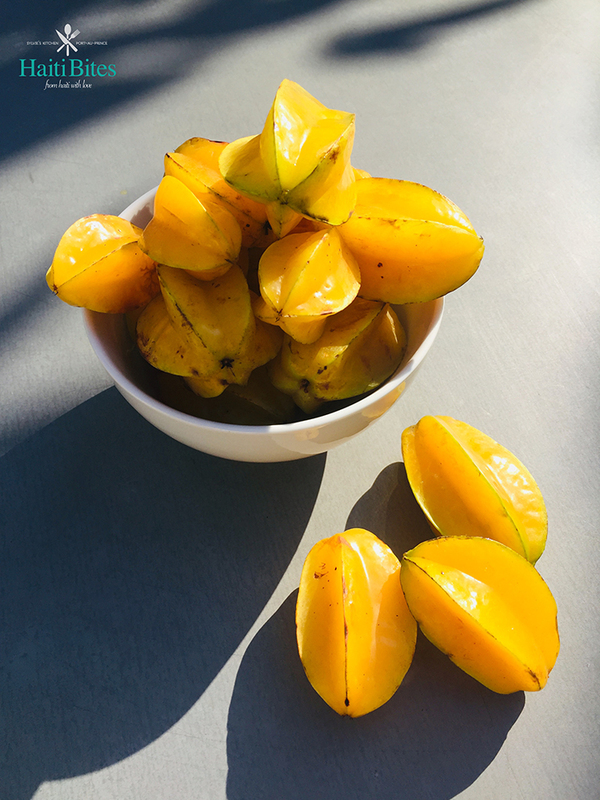 Also known as carambola, this beautiful green and golden yellow fruit holds virtues you couldn’t imagine. The skin is edible and the flesh has a mild, sour flavor. Crunchy and incredibly juicy, some say its texture resembles grapes, which makes it delicious to enjoy raw and ideal to include in a number of dishes. The smaller ones tend to be sour, while the larger one are on the sweet side. And every bite delivers loads of fiber, antioxidants and vitamin C with very low calories. 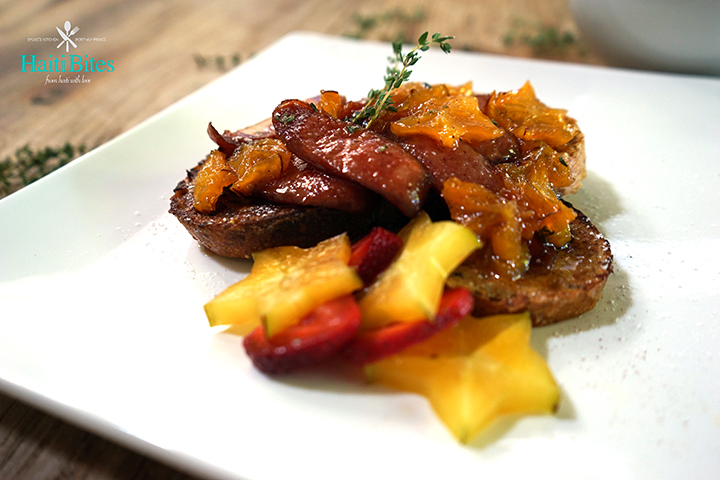 So go ahead, and carambola yourself into the long weekend with this dish and make it a happy breakfast for all ages. Wash your star fruits thoroughly and slice into beautiful 1/4" stars. Set aside. Slice your sausages. Set aside. Preheat your oven at 375° F.
In a pan over medium heat, melt 2 tablespoons of butter and add in your sugar, rum, water, lime juice, cinnamon and vanilla and bring into a thick syrup, stirring occasionally. Add in your slices of star fruit and let simmer 8 minutes, stirring occasionally. On a baking sheet, cook your sausages 8 minutes. In the mean time, in a mixing bowl, whisk together your eggs, milk, powdered sugar and cinnamon.This will be your batter for coating the French toast. Start prepping your French toasts. Heat a large pan over medium high heat and add 1 tablespoon of butter. Soak in your batter your slices of bread one or two at a time, and place in your hot pan with melted butter two or three at time, allowing them to cook to a beautiful golden color on each side. This will take about 3 minutes each side. 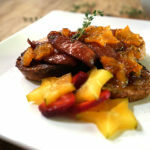 Remove your sausages from the oven and add them to the star fruit syrup and mix well, stirring in your fresh thyme, and allow to simmer over low heat for another 10 minutes while you prep your French toasts. When ready, remove your French toasts and place them on the same cooking sheet in the oven to finish toasting so they get an extra crispy outer crust. Start over with melted butter and slices of bread until you have completed all your French toasts. 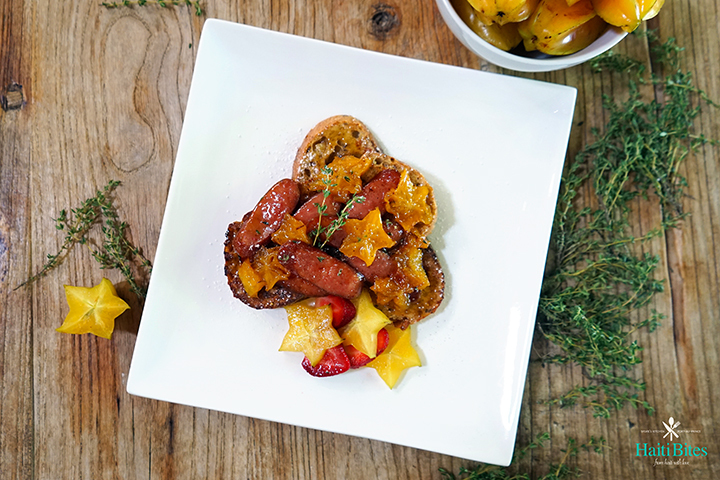 To serve, top your French toast with a generous serving of syrup, star fruit and sausages. Top with a sprinkle of cinnamon and powdered sugar, and a sprig of fresh thyme for garnish. Bon appétit! Copyright © Haiti Bites 2018 • All rights reserved.